Restaurant style Punjabi Dal Tadka recipe is very easy to prepare at home. Its one of the very famous recipe served along with roti, paratha in Indian restaurants. This flavorful recipe is prepared by cooking toor dal along with onion, tomato and flavored with generous amount of oil or ghee fried aromatic spices and herbs. 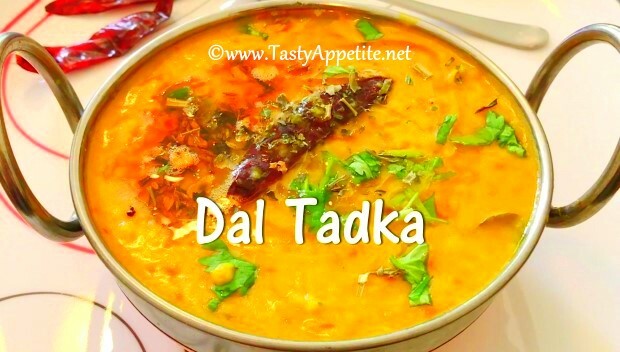 Enjoy the mouth watering taste of dal tadka with this easy video recipe! Wash and soak toor dal in water for 10 mins. Add green chilli, curry leaves and saute. Add chopped garlic, ginger, bay leaf and toss in high flame. Add finely sliced onions and saute. Add salt and saute onions until they're slightly browned. Add mashed tomatoes and cook until oil separates. Add turmeric pwd, hing and stir. Add soaked toor dal and combine. Add enough hot water and cover and pressure cook for 4 to 5 whistles. Once the pressure goes off, open lid and mash the dal. Heat 2 tbsp of ghee and 1 tbsp of oil in a small frypan. Add cumin seeds and allow to crackle. Add grated garlic and saute. Add red chilli, dried fenugreek leaves and red chilli pwd. Pour the hot tadka (seasonings) over the dal. Add freshly sliced coriander leaves and stir. Cover the dal with lid and set it aside for 5 mins. This enhances the flavor of tadka to mix with dal. Flavorful delicious dal tadka is ready.